If you’re thinking of picking up French as a second language or as a complementary skill to your existing repertoire, you’ve probably thought of getting French tutoring in Brampton. Tutors are almost essential at learning French or any other language, however tutoring won’t be very effective if you don’t know how to study on your own. Here are some pointers to do just that. Written and spoken French are two very different animals. If your goal is to speak French as quickly as possible, you either need to train with someone who speaks the language,, or listen to audio recordings of French words and phrases, along with their intended use. But don’t just listen to the first audio tutorial you find. First make sure it matches your learning level and speed. Choose one that builds on what you already know, or a tutorial specifically designed for beginners if it’s your first time trying to learn French. The goal with listening to audio is to develop your ability to speak French, and not your ability to fully understand it, as you can get away with guessing some words out of the context. 2. Practice Asking and Answering Common Questions. A great way of practicing your French on your own is to ask brief questions like, “How do you get to…”, “Can you tell me where…”, or “How much for…” and answer them with your own invented replies. Be sure to do this out loud so you can practice your pronunciation. Asking and answering questions are crucial components in any conversation. Just imagine going to France or Montreal for the first time—you can make an educated guess at the variety of questions you’ll be asking the locals. Also record yourself when you do this. You can listen to the recording later and spot where you made mistakes as well as how you’ve improved over time. When building your French vocabulary, do so not by discovering new French words and figuring out how to use them, but by translating English words and phrases that you want to use into French. The former is useful to fully understanding French, while the latter is more important when learning to speak it. This also keeps you from making the common mistake of simply reading a dictionary for words and developing a long vocabulary list of words you’ll never use. A good method of learning how to speak a language is with flash cards, which help you memorize several words at a time, and you can set them up to make phrases you want to use in a conversation. One of the best reasons to get French tutoring is to have someone who knows how to pronounce French words and phrases. A tutor can help you make sense of the various rules of French pronunciation and correct your mistakes, of which there will be many, as you speak. There is no perfect software or audio recording that can evaluate your pronunciation—at least not yet anyway. The best you can do is mimic recordings as much as you can, and even then your ears may play tricks on you. A real live French tutor can and will have you speaking properly with entire sentences, not just individual words. The trick to learning any language is repetition. The key to memorization is constant repetition, and by that I don’t mean 20 minutes worth of reading the same thing over and over again. It has to be done over the long term for it to be committed to your long term instead of short term memory. Work on your French on a constant basis, say half an hour each day, and 3 hours once a week. Your biggest challenge will be getting yourself to actually set aside the time for French, so a tutor in this instance can be of great assistance. 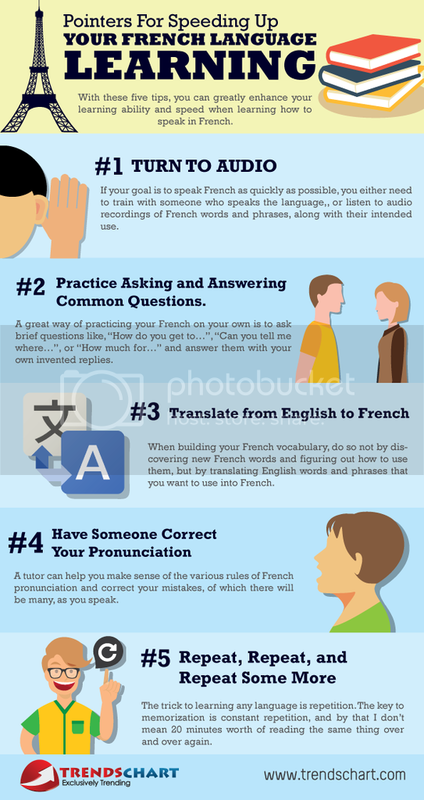 With these five tips, you can greatly enhance your learning ability and speed when learning how to speak in French. Good luck!